How many classes do you teach a day? How many preps? This year, I teach five classes (the norm here) and I have two different preps, but for the past three years, I’ve taught three preps and coached debate, so I was usually on the brink of losing my mind. I am also the person who has a million tabs open at any given time, which can be a bit overwhelming when trying to switch from one class to another. Last year, when our school made the move to Google, I found a way to stay sane. It’s a pretty simple concept, but sometimes those are the best ideas! 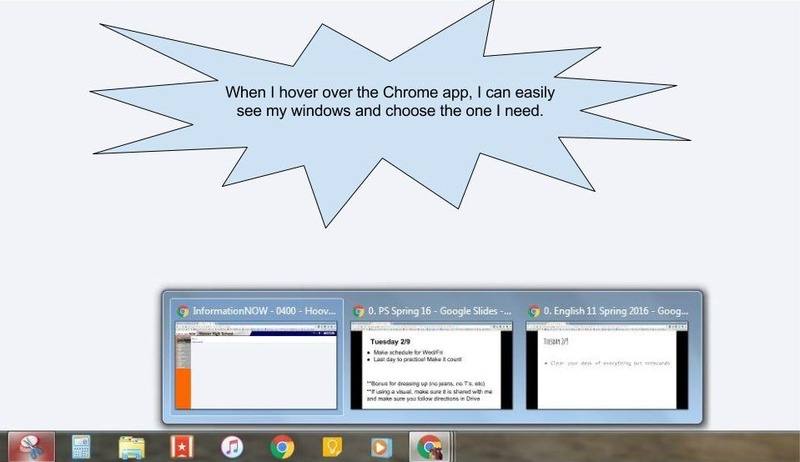 The first thing I do when I log into my computer is open three Chrome windows: one for administrative stuff, one for English 11, and one for Public Speaking. Sometimes I require more windows, but these are the three I have to have prepared for my day to run smoothly. Once I open my windows, I always have at least two tabs open for each class: Google Drive and the Slides I will be using for that day. If I have handouts, examples, or an assignment to show them, I’ll have those open before class as well. I use slides to put up a daily agenda, warm-ups, and directions for the day. This way the kids know what to expect as soon as they walk in the room, and it helps me next year to see how I did things (basically, the slides act as an addition to my lesson plans). As soon as 1st period Public Speaking is over and my 2nd period English 11 is headed in, I just hover over the Chrome icon on the tray until three choices pop up, scroll over to English 11 and BOOM, everything is ready for that class period. And then I can switch back when 3rd period Public Speaking comes in. When I have to Switch User for the 4th period floater to come in, everything is ready and waiting for me when I log back in. I’ve also found that this method allows me to teach a little more efficiently. I open the correct window with all my needed tabs ready to go, grab my wireless mouse, and head to the front of the room when it’s time to show the kids what we’re doing. 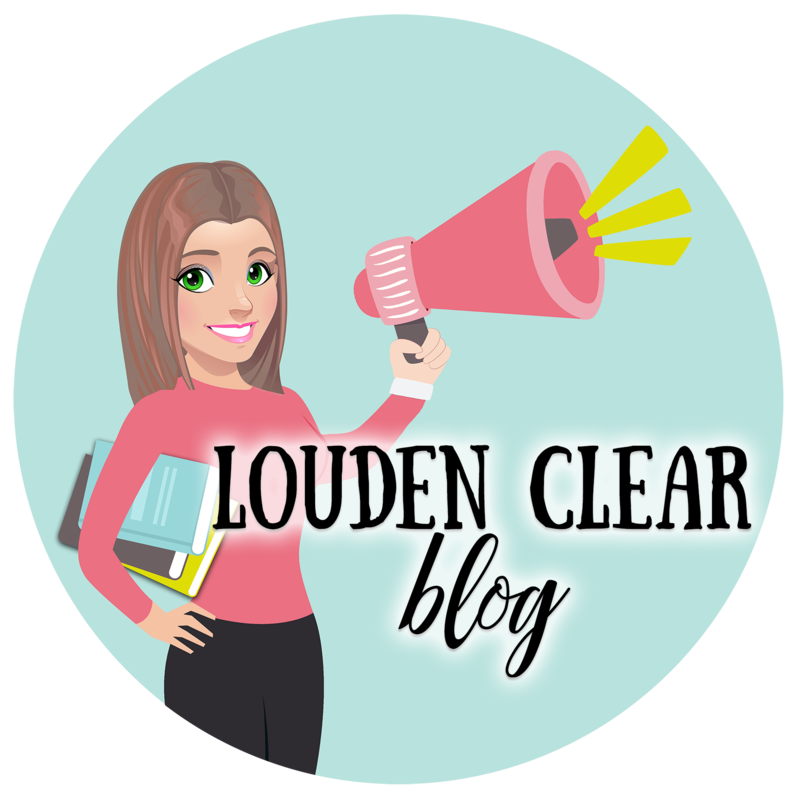 I can easily navigate between the things they need to see, without having to run back and forth between the front and back of the room, and unlike using a clicker, I can actually interact with my tabs, documents, etc. If you are a Google user at school, I highly recommend this easy way to organize your preps for the day. It becomes a habit if you do it as soon as you get to school each day, and you’ll find your class transitions go much more smoothly. What other tips do you have for staying organized with multiple preps? I’d love to hear them! 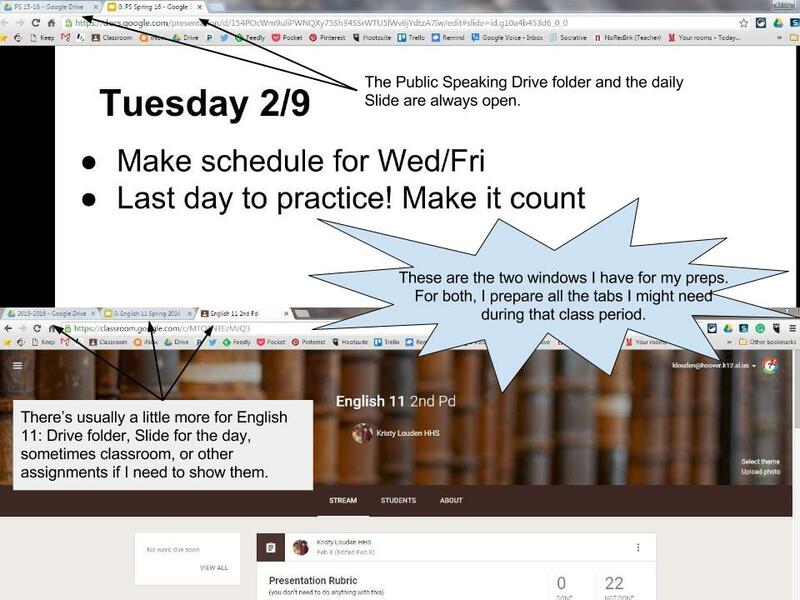 I also use right click-pin tab to keep my email/calendar/etc open but private while teaching and just in general. These are great tips! 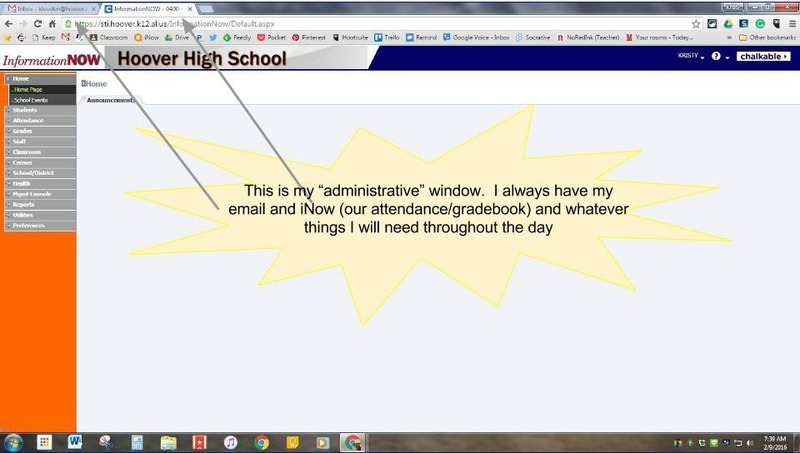 As an administrator, I have a routine, too. I open three tabs when I get to work… Gmail, Calendar, and Google Drive. I usually have about 8 other tabs open during the day, too! 🙂 But I always keep those three tabs as the first three on the left. Very helpful post for many!